Born and raised in Freetown, Mayor Aki-Sawyerr’s vision is to improve the lives of Freetown’s residents and to make Freetown a destination city. A finance professional with over 25 years of experience in strategic planning, risk management and project management in the public and private sectors, she was sworn in as Mayor of Freetown, Sierra Leone in May 2018. Her transformation plan will be delivered through a focus on resilience, human development, features of healthy cities and urban mobility; with the use of innovation as an underlying principle. Mayor Aki-Sawyerr’s delivery approach places a premium on community ownership, a heightened level of transparency and accountability and data-driven decision making. 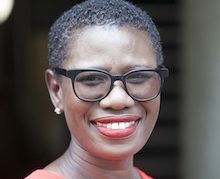 Mayor Aki-Sawyerr has held senior management roles providing risk management, regulatory and corporate governance consulting services to blue chip clients in the UK financial services industry. She was the Investment Director of IDEA where she was responsible for raising international financing for IDEA projects and for local stakeholder management. IDEA are the owners and developers of the Hilton Freetown Cape Sierra Hotel. She has spent more than two decades serving Sierra Leone both locally and internationally. She campaigned against the trade in ‘blood diamonds’ and advocated for ending the Sierra Leone civil war. In 1999, she co-founded the Sierra Leone War Trust (SLWT) which continues to support disadvantaged children and young people in Sierra Leone. She remains actively involved with SLWT and is a member of the Board of Trustees. From August 2014 to October 2014, Mayor Aki-Sawyerr led a campaign in the UK to increase international awareness of the Ebola outbreak in Sierra Leone and recruit volunteers to work in the Ebola Treatment Centres. Taking sabbatical leave from IDEA, she relocated to Sierra Leone in November 2014 and served as Director of Planning at the National Ebola Response Centre (NERC). In collaboration with others, she developed and implemented the strategy to end the outbreak in Sierra Leone. In recognition of her contribution to the Ebola response efforts, she was awarded an Ebola Gold Medal by His Excellency the President of the Republic of Sierra Leone in December 2015 and was made an Officer of the Most Excellent Order of British Empire (OBE) by Her Majesty the Queen of the United Kingdom in January 2016. Continuing her public sector service work, from January 2016 to September 2017, Mayor Aki-Sawyerr served as the Delivery Team Lead for the President’s Recovery Priorities – the second phase of a multi-stakeholder programme to drive sustainable socio-economic recovery in Sierra Leone post Ebola. She led the design and implementation of an innovative approach to public service delivery that facilitated, coordinated and supported the activities of eleven Ministries, Departments and Agencies in seven priority sectors to achieve specific targets over a 15-month period. A team player with a demonstrable record of leading institutional change, Mayor Aki-Sawyerr is passionate about the development of Sierra Leone and the transformation of Freetown. She is a Chartered Accountant and holds an MSc in Politics of the World Economy from the London School of Economics and a BSc Hons in Economics from Fourah Bay College. She is married with two children.